Let me begin by congratulating the Netherlands on assuming the Presidency of the Council, and thanking you for convening today’s debate on Afghanistan, which coincides with International Women’s Day. Today, we pay tribute to important contributions of women in promoting stable and prosperous societies. This day is an occasion to focus on what more needs to be done to empower women against many challenges that they face, particularly in conflict and post-conflict societies. I am pleased that Her Excellency Julie Bishop, Foreign Minister of Australia, will be joining our meeting later, and my good colleague Dr. Habiba Sarabi, Deputy Chairperson of the High Peace Council of Afghanistan is among us today. I thank SRSG Ambassador Tadamichi Yamamoto for his briefing. Today’s meeting provides another occasion to assess the overall situation in Afghanistan. I am pleased to report that in the course of the past three months, the imperatives of Afghanistan’s security, stability and development received added international attention, with particular focus on addressing the root causes of the conflict and strengthening our defensive and security capabilities in parallel with efforts to devise a more practical peace plan. Our security forces, with better support from international partners, have increased pressure on terrorist groups across the country. Nevertheless, regional sponsors of terrorism, having faced international pressure and setbacks in the countryside, remain belligerent, as reflected by their efforts to engineer violent attacks in urban centers with high numbers of civilian casualties. Despite this, governance reform and economic development have continued unabated. A national dialogue among various political forces has been underway on issues that are crucial to our unity and political stability, the success of our peace efforts, and preparations for holding timely and transparent parliamentary elections this year. Afghanistan has always emphasized that our partnership with the international community has been a strategic asset for advancing shared goals of defeating terrorism and achieving stability. In this light, the UN Security Council’s January 13-15 visit to Kabul and its high-level meeting on January 19 on the security and development of Afghanistan and Central Asia, were clear signs of international support at the highest level. We are grateful to all members of the Council for their collective commitment and improved consensus on a more focused engagement on key issues related to Afghanistan’s security, stability and development. We wish to offer a special debt of gratitude to my esteemed friend and colleague Ambassador Kairat Umarov for his personal efforts in this regard as President of the Council in January. During the Kabul visit, this Council discussed a range of security, political, economic and social issues with Afghanistan’s leadership in government, parliament, judiciary, High Peace Council, political parties and civil society. 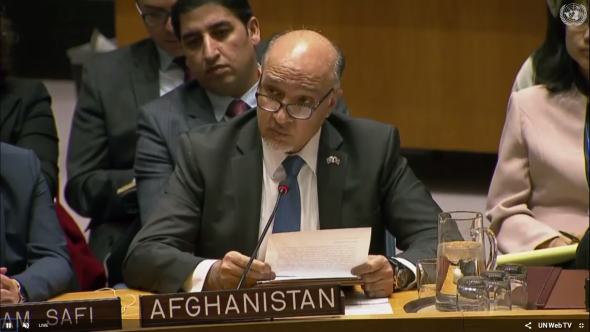 One common request pertained to effective Council action to address the sponsorship of terrorist outfits and the problem of their regional safe-havens, as a priority need for security and stability in Afghanistan, which was also reflected in the recent report of the Secretary-General on the Situation in Afghanistan. Of late, we have seen new measures at the international level to shift the calculus and promote genuine and productive counter-terrorism cooperation. 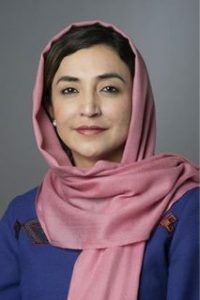 In this regard, recent decisions including the reduction of financial aid to the concerned State, and inclusion in the watch list of the Financial Action Task Force (FATF) represent a renewed attempt to encourage genuine action on the crucially important goal of defeating terrorism effectively. We hope that this trend continues and the response to these measures is positive, in the interest of peace and security in Afghanistan and the region. Days after the Security Council’s visit and almost immediately after the January 19 high-level meeting of the Council, regional sponsors of terrorism, through their trained violent proxies unleashed a new wave of terrorist attacks. The sheer level of savagery in these despicable and heinous attacks was startling. Armed gunmen from the Taliban’s Haqqani network attacked the Intercontinental Hotel in Kabul, killing 18, including 14 foreign nationals, and wounding many more. The subsequent week witnessed two more barbaric attacks; one in Jalalabad’s compound of the international NGO “Save the Children,” where 27 people died; second, an explosive-laden ambulance detonated next to a major civilian hospital in the heart of Kabul. The blast destroyed vehicles, shops, and buildings nearby, killing at least 105 civilians, and injuring 235. The use of an ambulance for such a ghastly attack is a war crime under international law, including international humanitarian law. This Council condemned the attacks and cited the need to hold the perpetrators, organizers and financiers of the attacks to account. Yet, despite all the evidence linking these attacks to regional sponsors, once again, the question is when will that happen? Last week, Afghanistan convened the 2nd meeting of the Kabul Process for Peace and Security Cooperation. This marked a major development in the context of peace efforts aimed at ending the conflict and achieving a credible and just peace that conforms to the aspirations of all Afghans. In recognition of our people’s demand for ending violence, President Ghani reached out to the Taliban in an unprecedented manner, calling for direct talks without preconditions. Should our call receive a positive response, they will be granted the chance to become normal citizens, allowed to compete peacefully in politics through democratic procedures, be relieved from UNSC sanctions measures, besides enjoying the benefits of other positive measures. In turn, they have to give up on their long-standing path of violence. Moreover, our peace process aims to “protect and expand” not diminish, the rights of our people, especially women. The time is now for the Taliban to respond affirmatively and seize the historic opportunity before them. We are inspired by the international community’s level of support to our new peace plan. The conference renewed the call for tangible measures in combating terrorism, in accordance with obligations stipulated in the UN Global Counter Terrorism Strategy, and various Security Council counter-terrorism resolutions. We hope that States who failed in this endeavor will adopt a new approach, based on expressed commitments, for the benefit of regional security. For too long the debate on state-sponsored terrorism has been kept away from international forums, including the United Nations. Beyond the intelligence networks, the rest of the world knows little about the behavior of this aspect of terrorism at national, regional and international levels. The regional state sponsors of terror outfits exported to our country have recently pursued new methods of denial and belligerence by playing reverse psychology and attempting to distort narratives. Irrefutable evidence of complicity in facilitating safe havens and logistical support to terrorists has been responded to by failed methods of counter-narration – accusing Afghanistan of “providing safe havens to terrorists.” Exploiting the democratic political dynamics of Afghanistan, they attempt to sow discord among our people, victimize refugees by unfairly linking them to terrorism, and portray their orchestrated terror attacks as “civil war.” Meanwhile, according to the latest UN report, we have suffered more than 10,000 civilian casualties yearly, over the past four years, mainly caused by terrorist attacks plotted beyond our frontiers. In desperation they don’t even hold back from such heavily risk-prone attempts as to abuse and manipulate ironclad and all-weather friendships in international relations in favor of concealing the evidence of their sponsorship of terrorism, obfuscating facts and distorting narratives at regional and global forums. In light of increased terrorist activities around the world, the time has come that we openly debate the regional state sponsorship of terror outfits exported to our country and let the world know more of its behavior. The Kabul Process is not just about outreach to the Taliban. It is about ending the conflict, achieving peace and preserving the democratic order for which numerous Afghans and allies have sacrificed their lives. Moreover, the Taliban should not be permitted to misuse the opportunity presented as they have done so in the past. As we grapple with security challenges, we are working to achieve important objectives, stipulated in the agreement that founded the National Unity Government, witnessed and welcomed by the international community. This is essential for our national unity and political stability as along with the success of our new peace plan. The effort is carried out within the parameters of a broad-based dialogue, with a view to advance the national interest of Afghanistan, in conformity with the spirit of our constitution. Our overall objective is to advance national unity, strengthen social cohesion, and inclusivity to achieve a just and peaceful society, fully grounded in the rule of law where our youth can fulfill their national aspirations. We are confident that our efforts will soon yield positive outcomes. On today’s special occasion, I reaffirm the National Unity Government’s commitment to empower women’s role in all facets of our society and polity. Dr. Sarabi’s presentation offered a clear perspective on progress made against the benchmarks of our national strategy and resolution 1325 and the challenges ahead of us. We now have female ministers, deputy ministers, MPs, peace makers, civil society activists, and ambassadors serving as proactive public agents for the development of Afghanistan. Two weeks ago, in a historic occasion, Chief Executive Abdullah Abdullah, represented Afghanistan at the inaugural session of the Human Rights Council in Geneva. 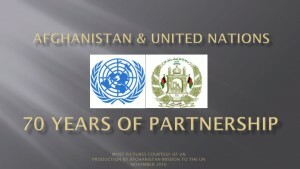 This symbolized Afghanistan’s overall commitment to universal human rights principles. Despite the progress, we know that our achievements for promotion and protection of human rights need consolidation, as manifested in the UNAMA report on civilian casualties that I mentioned earlier. Against all odds, Afghanistan has progressed steadily on the path of economic cooperation, increased regional connectivity, and shared prosperity. We have expanded on multidimensional relations with our Central Asian neighbors, resulting in numerous agreements in the areas of trade, connectivity and economic cooperation. The inauguration of Afghanistan’s segment of the TAPI project in Herat by President Ghani and leaders and senior officials of Pakistan, Turkmenistan and India, after over a decade of preparatory work has generated new incentives for cooperation and opportunities for mutual trust and confidence. Additionally, other regional projects aim to boost productivity and economic cooperation for common gains. We are looking forward to the forthcoming Tashkent conference on Afghanistan. We wish to expand relations with all partners, including the UN. We are grateful for the crucial assistance role of UNAMA, which have been a catalyst in bringing change to the lives of our people. We welcome the adoption of the UNAMA mandate renewal, and underscore once again, the imperative of ONE-UN approach for optimum efficiency and coherence. Let me re-convey our appreciation for the dedicated efforts and leadership of SRSG Ambassador Yamamoto, a dear friend. Combating the illicit network of narcotics, money laundering, and terrorism finance remain a key priority for us. Based on our National Drug Action Plan, we have continued eradication operations, and opiate seizures have reached highest levels since 2012. We will continue to expand cooperation with our allies to strengthen relevant law-enforcement agencies, greater intelligence sharing, and drawing effective mechanisms to curtail drug trafficking. Additionally, refugee repatriation from neighboring countries remains operational. We are working in close collaboration with the UNHCR to provide assistance and much needed services to this vulnerable group. We call for continued international support for the joint Humanitarian Response Plan 2018 – 2021, which requires $437 million for 2018 to assist 2.8 million people in need. However, security and durable peace are fundamental solutions to tackle this humanitarian challenge, which require comprehensive national, regional, and global commitment and action. Two weeks from now, 21st of March will mark the onset of Nowruz, the Afghan New Year. We are starting this new spring season with hope, determination and confidence. As international pressure on addressing the root causes of violence in our country intensifies, our defense and security forces stand capable as before to protect and defend Afghanistan against international terrorism. That said we have taken a historic step for the restoration of a durable peace in our country. In this light, we look to international partners, this Council included, to remain beside us in this endeavor.